Cyberoam, a leading global provider of network security appliances, has launched CR10wiNG, the "fastest and most affordable UTM appliance", with built-in WiFi capabilities for the SOHO/ROBO markets. Cyberoam, a leading global provider of network security appliances, has launched CR10wiNG, the "fastest and most affordable UTM appliance" with built-in WiFi capabilities for the SOHO/ROBO markets. The CR10wiNG wireless appliance supports 802.11 n/b/g standards and up to eight virtual access points. It delivers UTM security features over WLAN to offer enterprise-level security and meet the requirement of mobility in this segment. 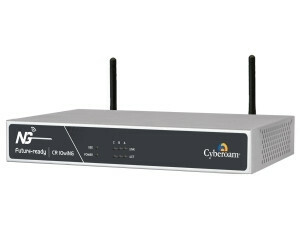 Cyberoam CR10wiNG offers high performance with firewall throughput of 400Mbps and UTM throughput of 60Mbps. The wireless networks in organisations face a huge risk of information theft due to their inability to trace users, especially guest users, within the network. Additionally, lack of IT security staff and budgetary constraints make it difficult for the SOHO/ROBO segment to find security solutions that are adequate, cost-effective and easy to manage. Also, organisations with distributed networks, remote and branch offices, especially in sectors like retail stores, logistics and transportation, and utility distribution centres, demand mobility within the network and need network security, secure remote access, and secure WiFi for walk-in customers. CR10wiNG, based on Cyberoam's patented Layer 8 technology, allows administrators to apply user identity-based security policies to gain visibility over user activity and also manage guest Internet access in the network. CR10wiNG supports multiple virtual access points that create independent, segregated networks in the same physical area for separate teams like sales, marketing, guest users, and more. This offers secure authentication and prevents rogue clients from connecting to networks where they don't belong. "CR10wiNG is designed for small and branch offices to offer secure WiFi at par with wired security. It enables a leaner WiFi security infrastructure to organisations by replacing both WiFi router and firewall with a single appliance. For remote offices with limited connectivity options, CR10wiNG also offers 3G/4G USB support," said Abhilash Sonwane, Sr Vice-President - Technology & Products, Cyberoam. Cyberoam CR10wiNG is built on the same CyberoamOS that powers other high-end NG series UTM appliances. It is centrally manageable via Cyberoam Central Console (CCC) and Cyberoam's on-Cloud Management Service, and is compatible with iView - Cyberoam's open source logging and reporting solution. Cyberoam Technologies, a Sophos company, is a global network security appliances provider, offering future-ready security solutions to physical and virtual networks in organisations with its next-generation firewalls (NGFWs) and unified threat management (UTM) appliances. The virtual and hardware Cyberoam Central Console appliances offer centralised security management options to organisations, while Cyberoam iView allows intelligent logging and reporting with one-of-a-kind, in-depth reports. Cyberoam is accredited with prestigious global standards and certifications like EAL4+, CheckMark UTM Level 5 Certification, ICSA Labs, IPv6 Gold logo, and is a member of the Virtual Private Network Consortium. For additional information, promotions and updates, visit www.cyberoam.com and follow Cyberoam on Twitter @Cyberoam, on Facebook, or on the LinkedIn company page.